Pope Francis is welcomed by Abu Dhabi's Crown Prince Sheikh Mohammed bin Zayed Al Nahyan, upon his arrival at the Abu Dhabi airport, United Arab Emirates, Sunday, Feb. 3, 2019. 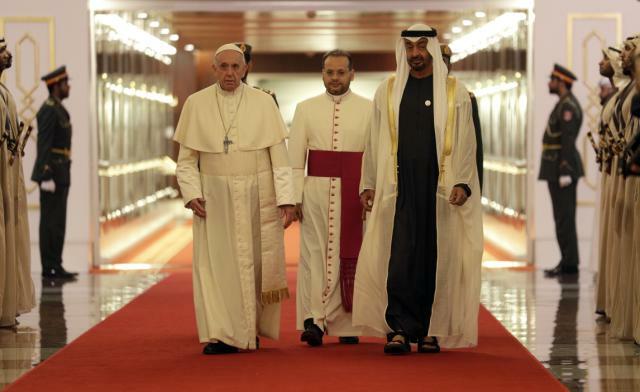 Francis travelled to Abu Dhabi to participate in a conference on interreligious dialogue sponsored the Emirates-based Muslim Council of Elders, an initiative that seeks to counter religious fanaticism by promoting a moderate brand of Islam. ABU DHABI, United Arab Emirates: Pope Francis landed Sunday in Abu Dhabi on the first-ever papal trip to the Arabian Peninsula, where he is seeking to turn a page in Christian-Muslim relations while also ministering to a unique, thriving Catholic community.